Whew! We finally have internet service here in Aswan, Egypt. Our group arrived in Cairo a few days ago (I’m really starting to lose track of time). 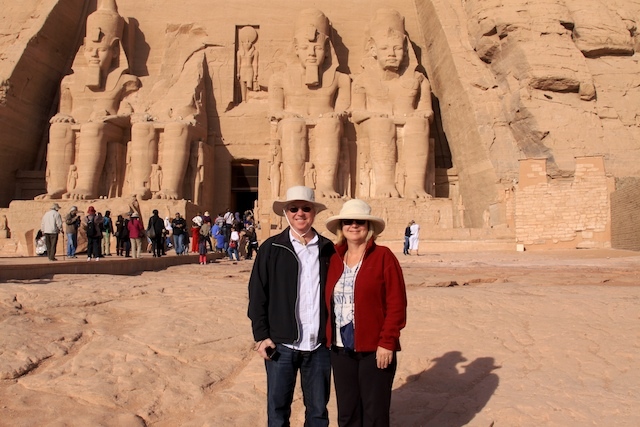 We spent the next day at the Egyptian Museum in Cairo, then flew on down to Aswan. Cairo is a city of 20 million — a real wake-up after sleepy Jordan. Our hotel in Cairo was complete with several bars and a casino — it almost felt like Las Vegas. Jordan is so conservative it was tough getting a beer there, Egypt is a real contrast, though I am listening to evening prayers right now — I seem to always hear them in the evening and before sunrise. And most women are wearing veils — I didn’t remember seeing that 30 years ago. 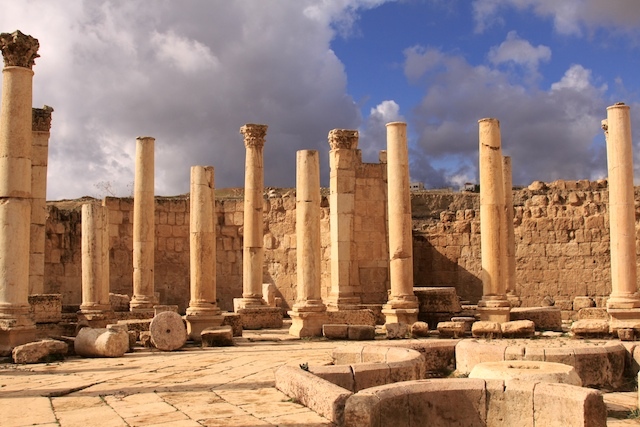 This photo is from a Roman city in Jordan called Jaresh. We were astonished at the extent and condition of the ruins and there were so few tourists we had the place to ourselves. After visiting several sites on the way, we finally arrived in Petra late Sunday. The next morning it was cold and cloudy, I was so sad thinking I wouldn’t get any photos (there’s nothing worse than a landscape with a white sky). But by the time we walked the 2.5 miles into the town, the clouds had burned off and it was a spectacular day. We’d had wonderful weather all but one afternoon. 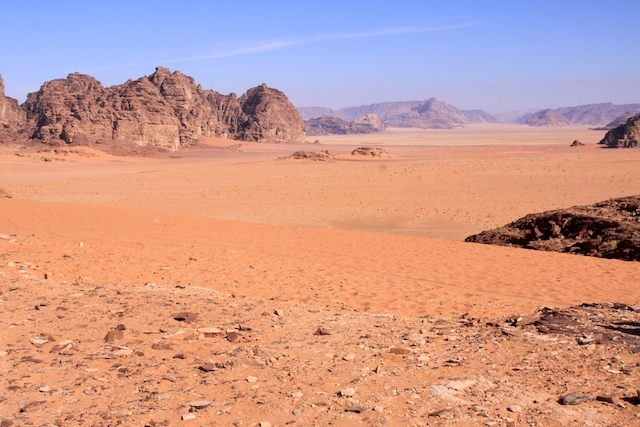 Jordan is so desperate for rain I felt bad wishing the weather forecasts were wrong. Petra was even more magical than I ever imagined. For one thing — it’s a whole city — not just the Treasury building. 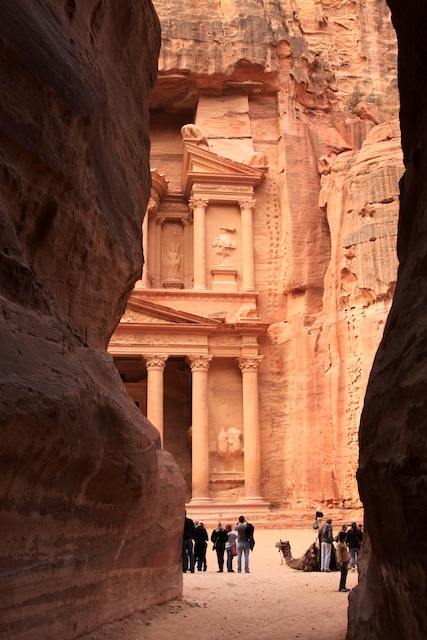 Petra was built by the Nabateans around 600 BC. The Romans moved in and built three theaters, baths, and several temples. 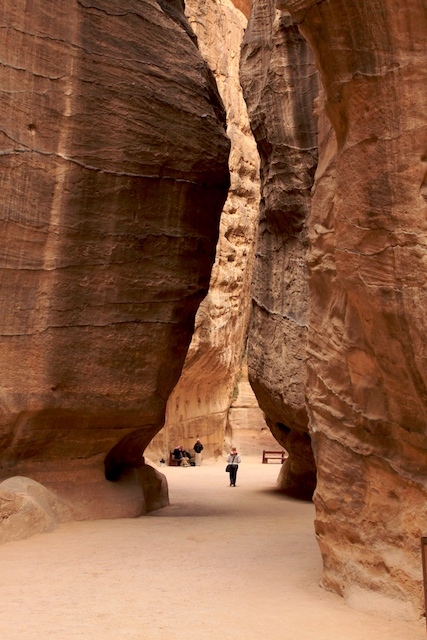 Up until 1985 the Bedouins were living there in the caves, but when Petra became a World Heritage Site the Bedouins had to move out. A town was built for them close by — where our hotel was located. 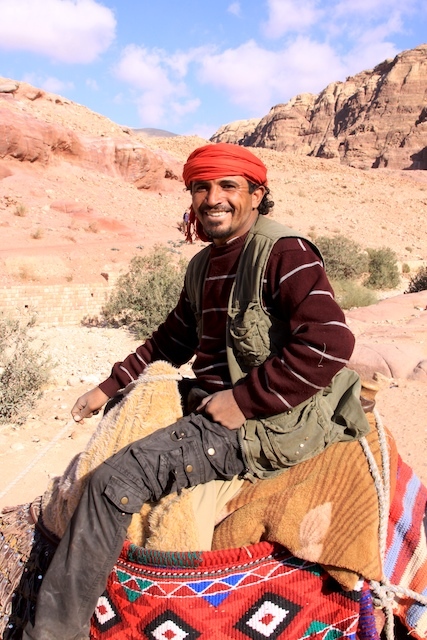 The locals still make their living in Petra: giving horse and camel rides and selling trinkets. I managed to last all morning but finally broke down and went for a ride. My camel is about three years old and very sweet. No moaning and groining when I climbed on like the camels in India. 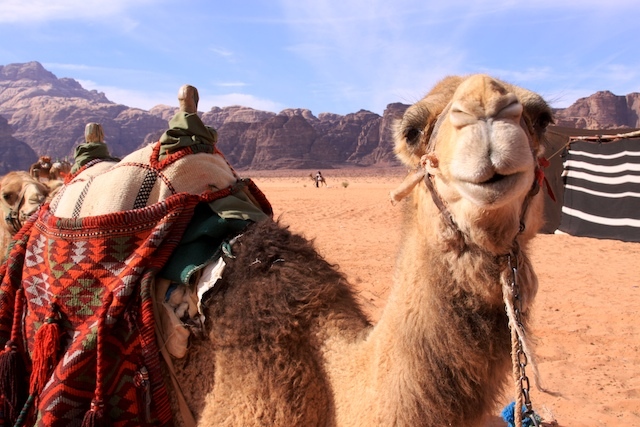 We left Petra and spent the next morning in Wadi Rum — Lawrence of Arabia country. They took us 4-wheeling across some particularly scenic parts than we had a traditional Bedouin lunch at an oasis. 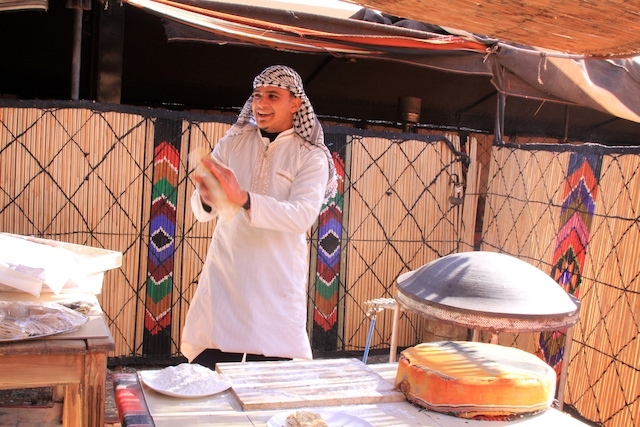 I really enjoyed the “Bedouin pizza” — pita bread stuffed with goat meat. Making "shraak" very similar to a flour tortilla but better! 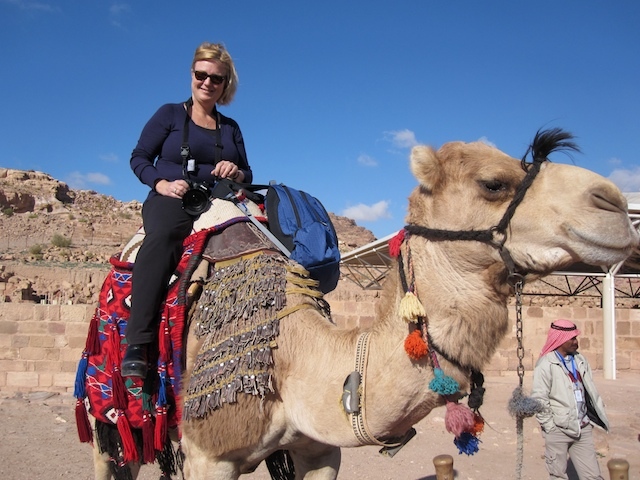 And there were more camels…. We’ve been to so many temples it’s all starting to blur. It’s a good thing I take a lot of photos to jog my memory. This morning we got up at 4 and were on the road at 5, yes 5 am (can you believe we haven’t slept past 6:30 since we got here?) to drive down to Abu Simbel where we saw the temples of Ramses II and Nefertari (his favorite wife — who was Nubian). These were some of the temples that were moved after the high dam was built in Aswan back in the 1960s. 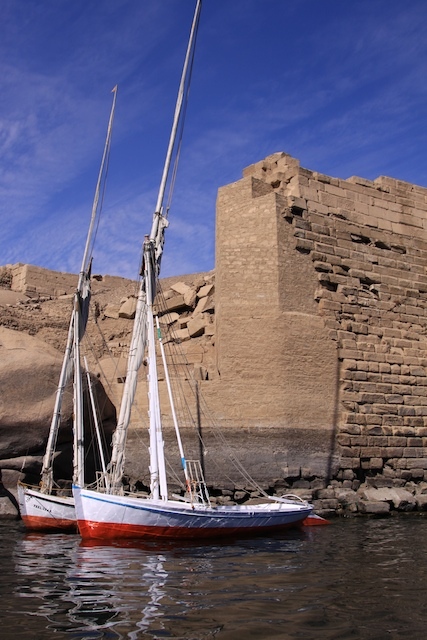 If they had not been moved, which was nothing short of miraculous feat of engineering, they would have been completely covered and destroyed by Lake Nasser. Tonight we’re going to dinner at a local’s home. We did that one night in Amman and had an interesting time. We’ll have plenty of stories to tell when we get home. Hope all is well — we miss you! This entry was posted on Friday, January 14th, 2011 at 4:15 pm	and posted in Uncategorized. You can follow any responses to this entry through the RSS 2.0 feed.